That's where the Laundry comes in - it's a branch of the British secret service, tasked to prevent hideous alien gods from wiping out all life on Earth (and more particularly, the UK). Your work for the Laundry. The hours are long, the pay is sub-par, the co-workers are... interesting (in the Chinese curse sense of the word), and the bureaucracy is stifling - but you do get to wave basilisk guns and bullet wards around, and to go on challenging and exciting missions to exotic locations like quaint, legend-haunted Wigan, cursed Slough and Wolverhampton where the walls are thin. You may even get to save the world. Just make sure you get a receipt. 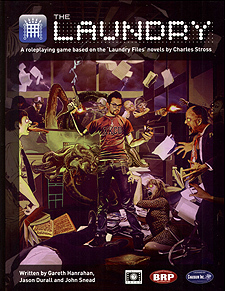 The Laundry RPG is a roleplaying game based on the 'Laundry Files' novels by Charles Stross.